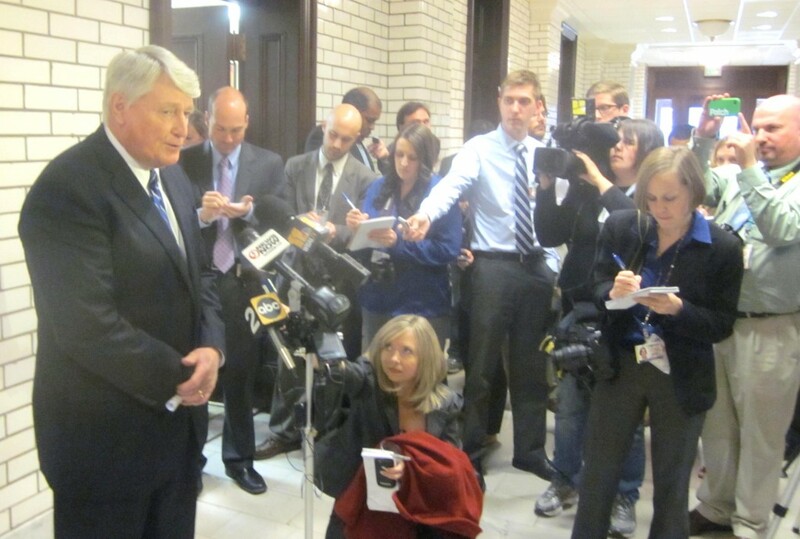 House Speaker Michael Busch talks to reporters Monday afternoon. It’s called Sine Die — without a day — but it actually might be doomsday, with budget cuts substituting for the tax hikes House and Senate refuse to agree on. With the end of the legislative session 10 hours away, members of the Senate and House of Delegates met again and decided not to compromise. told the conferees. Both chambers had already passed a budget that included cuts that would happen only if they failed to agree on revenues. Members of the Senate have expressed discontent at the unwillingness of members of the House to meet the Senate halfway on various revenue issues. “We just feel from a good faith perspective we’ve gone a lot toward them,” Sen. Edward Kasemeyer, D-Baltimore County, told the Senate. Kasemeyer said that those concessions have not been reciprocated. Kasemeyer reiterated his position to the House members an hour and half later. “I think we’ve made a huge compromise on the rates,” said Sen. Jim Robey, a budget subcommittee chairman. House Majority Leader Kumar Barve said the House had already conceded on the shift of teacher pension costs to the counties. “Unless we have an agreement we’re prepared to let the body adjourn without having a budget agreement,” Miller stated. The General Assembly is constitutionally required to balance the budget. If an agreement is not met by midnight tonight the legislative session will have to be extended for the first time since 1992. Members of the House disagree with the assertion that they have not compromised and blame the inability to reach an agreement on a gambling bill supported by Miller and some senators. At an unscheduled press conference, House Speaker Michael Busch said if senators “are more concerned about the obsession with gaming” than passing a balanced budget they can wear that when they go home to their constituents. With hours to go, a visibly irritated Busch said the House was ready to move forward with the budget and called on the Senate to join them. O’Malley followed Busch at the press conference, stating that the “clock is ticking” on a budget agreement. The governor has expressed support for the House version of the tax hikes, which more closely resembles the plan he originally proposed. O’Malley said it would be difficult for the General Assembly to pass a budget before midnight. “We are all elected to serve in an arena of compromise,” O’Malley stated. Here’s a video of Busch and O’Malley speaking to reporters about the stalemate.